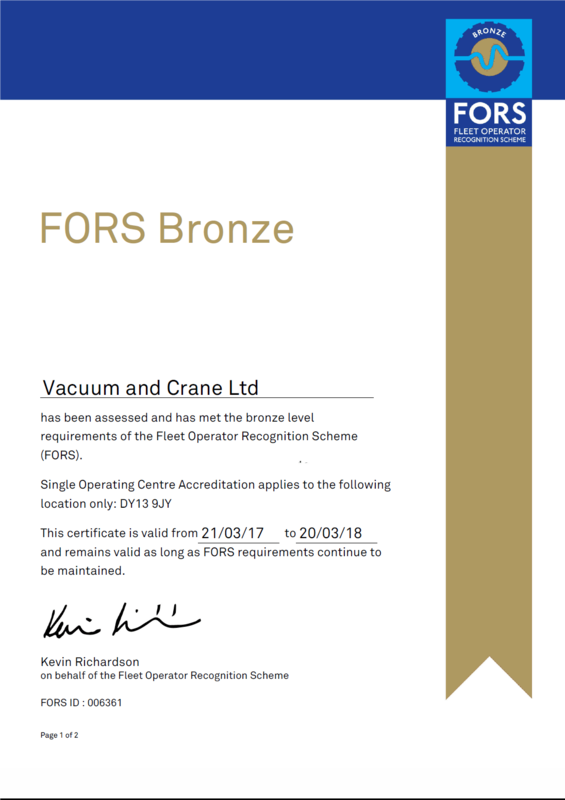 Vacuum and Crane Ltd has added another string to it’s bow by being awarded a bronze FORS accreditation. Health and safety is a main priority for Vacuum and Crane. So we’re pleased to announce that we are now officially a bronze status FORS accredited company. Many construction sites in London require vehicles to be accredited and the program also reduces CO2 emissions, accidents and congestion by recognising good working practice. Read more about Vacuum and Crane’s very own FORS accredited transport fleet which delivers our plant equipment to customers more safely and efficiently than ever. The Fleet Operator Recognition Scheme is a voluntary accreditation that encompasses all aspects of safety, fuel efficiency, vehicle emissions and environmental awareness. FORS helps fleet operators to measure, monitor performance and alter their processes in order to demonstrate best practice. In March 2017, following a successful audit, Vacuum and Crane were awarded the Bronze accreditation. The commitment to running the company efficiently and safely is paramount to Vacuum and Crane. By becoming accredited, we once again demonstrate our commitment to road safety, and the well-being of the public. All of our drivers and technicians have, or will be, taking part in the Safer Urban Driving Course which will see them both in the classroom and out on the road on a bicycle. All of our new vehicles will be delivered fully FORS compliant, with audible turning signals and on-board cameras, and all of our older vehicles are in the process of having these extra safety devices fitted. Vacuum and Crane are now working towards obtaining a Silver certification, which should take approximately 12 months whilst records of fuel and tyre usage are documented. The FORS logo will be displayed on the vehicles over the coming weeks, keep a look out!